Successfully Added GSM+PSTN Wireless Security System - PIR Motion Detection, Door Sensor, Alarm Control, Loud Alarm Siren, SMS Notifications to your Shopping Cart. This fashionably designed smart home security system makes use of GSM and PSTN support to bring alarm notifications to your Smartphone no matter where you are. This smart security system is this simple way to keep your home secure. GSM and PSTN bring global coverage while support for up to 116 wireless sensors means that no matter the size your property you can build the perfect custom system to keep your home, office or business safely protected. A simple beautiful design with wireless sensors makes this home security system easy to install so there are no unsightly cables required. The sleek control panel brings a modern futuristic look to your home and with clear tough buttons offers easy, intuitive interaction for great control. As well as the control panel this kit comprises of a PIR motion sensor, door / window sensor, loud siren unit and two remote activation controls. All the sensor can communicate with the control panel up to 100 meters so you shouldn't have any problem locating them anywhere around your home. With the PIR sensors 110 degree, 10 meter range you can cover an entire room while the door / window sensor will keep any doorway or window under close surveillance, notifying you directly if it's been open, great for securing the office, stock room or main entrance. each sensor works wirelessly and the main control unit has a 800mAh back up battery so even if the power is cut you will have 16 hours of surveillance. 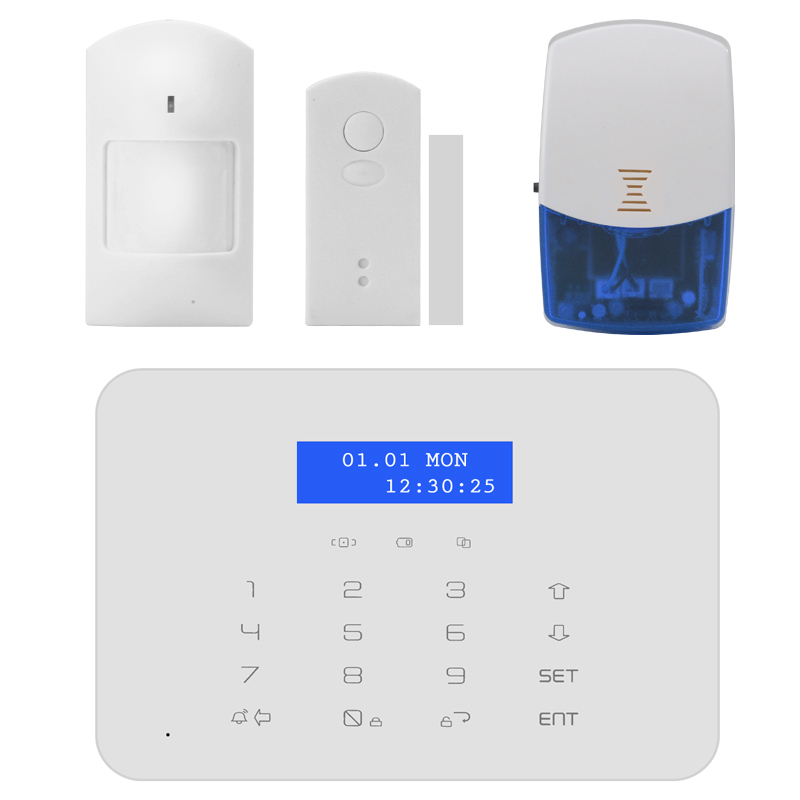 This GSM+PSTN Wireless Home Security System comes with a 12 months warranty, brought to you by the leader in electronic devices as well as wholesale home security systems..